Safavieh Madison Vintage Snowflake Medallion Cream/ Navy Rug - 5'7" x 7'6"
Safavieh Madison Vintage Snowflake Medallion Cream/ Navy Rug - 6'7" x 9'2"
A marvelous exhibit of trendsetting transitional rugs, the Madison Collection instills life into extraordinary spaces. Expertly power-loomed in Turkey, these rugs are easy-care and virtually non-shedding. Classic designs become fashion-smart home decor in this alluring and playful collection. 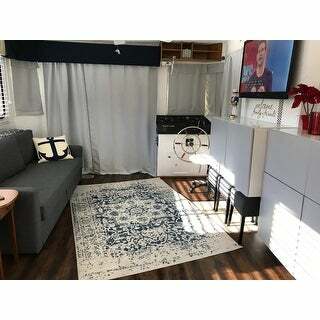 The Safaveih Madison Vintage Medallion Cream/Navy Distressed Rug (5’x8’) I received from Overstock.com fits perfectly, size and color, in my bedroom. The distressed look adds to the ambience of the room’s coziness. I received the item undamaged and in new condition. I easily unpacked the rug and placed it on the floor immediately. I would recommend the purchase of this beautiful rug with an anti-slip accessory, as the rug does tend to slide easily. The cost is definitely worth the purchase. Just received my rug today. Ordered Monday and arrived in two days, extremely pleased with the fast shipping. Rug was packed well and arrived with no damage. It’s absolutely beautiful in person. Soft, plush and perfect under my bed (over carpet). I’d recommend a carpet pad if using on hard floors. The colors are exactly as pictured and match my farmhouse perfectly. Didn’t want to take away a star but the rug is slightly smaller than advertised. I ordered the 5x8 and it’s actually 5x7. Otherwise I’m completely thrilled with my purchase. I intend to buy another while it’s still on sale. I have been searching and searching for a rug in the navy and cream color scheme that would not clash with my recently recovered sofa. On my third attempt, I found these rugs on Overstock. I decided to give them a try and I was not disappointed. The colors are both vibrant but not so much that the rug appears busy. Nice purchase! Great rug for the price! I will say the design bc of the “vintage” looks a bit more abstract of a design compared to an Oriental rug... and the blue is very vibrant not faded. So if you’re looking for a muted rug, which I was, this might not be for you. I’m still keeping it... and I like it. 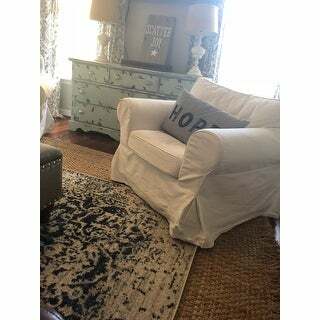 I love the vintage and distressed look of this area rug. The cream and navy colors look really nice in the guest room. The rug is easy to spot clean and vacuums nicely. We bought this rug in different sizes and love the colors. They are just like the picture. I just received this rug today. It came sooner than expected and was packaged very well. It goes well with my current decor. It will go in my dining area once I’m finished with my dining table and dining chairs project. I ordered a 5’x7’ and it was true to size. The colors were true to the description on the website. It was exactly as I expected and quality is great as expected and described. 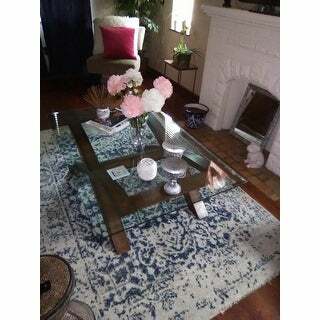 This is the second safavieh rug I order from overstock and both the quality of safavieh and the prices of overstock can’t be beat! I would recommend this rug it’s a great buy. You definitely will need a nonslip pad underneath this rug for sure. I’ll post pictures once I have completed my dining table and dining chairs project. 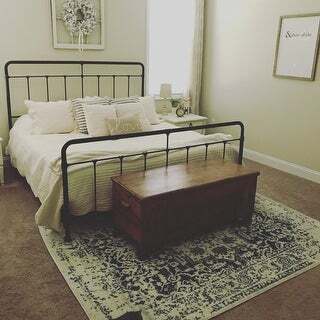 This is the third Safavieh rug I have purchased from Overstock and am just as happy with this one as I am the other two. I purchased this rug to brighten my room and it does exactly that. It has dark blues in the rug but it is mostly a creamy white - not pure white. The edges are blunt and simple. It came curled up and uncurled easily and didn't need any extra weights to keep it flat. There was minimal smell to it - I didn't smell it but guests that came in the room for the first time could smell it. But it was not overwhelming. 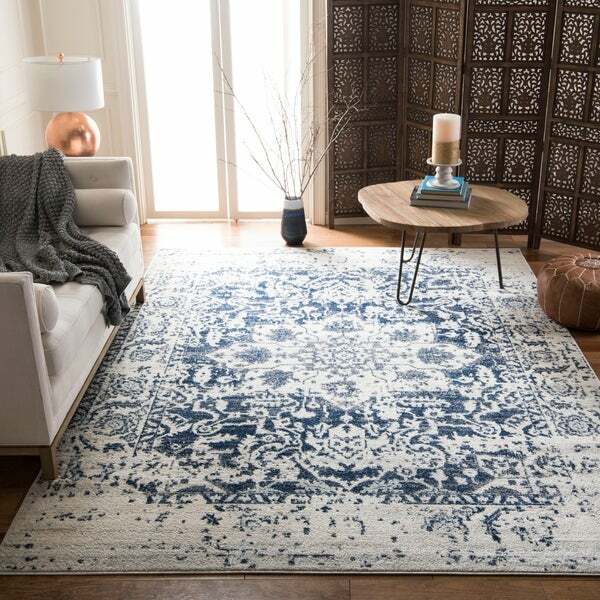 I got this rug at a great price - the sales at Overstock are the best time to make any large purchase as you can usually find great deals on rugs and furniture. Beautiful navy color and distressed design! This rug is gorgeous. A bit thin but it doesn’t look cheap. I’d definitely recommend a rug pad to put underneath it. I had been eyeing it for a while and couldn’t resist the sale price. Love it! Based on the original price, I expected a better quality product. This product wasnt worth the sale price of $80. I've seen $39 rugs with better quality. Although it's advertised as distressed, the blue isn't as vibrant as the picture and is washed out. It's thin and the backing is hard and will probably crack within a year. quality is comparable to the five and dimes. Not worth paying the S&amp;H to retun. Yes I would recommend this purchase. What I didn't like about this rug was it was a little thin, but I put a carpet pad under it. One more thing that I like about this carpet is that it was easy to clean and faster to dry. This rug is beautiful. Perfect for under our dining room table! Great quality, was delivered in less than 48 hours and such a great deal. Two thumbs up! Better in person than pictures. Love it! Beautiful rug. Hides stains and crumbs well. Low pile makes it easy to vacuum. Love these rugs! They are beautiful and great quality. It’s looks great with my cream sectional and my dark floors. I also got a runner to match for my hallway and I couldn’t be happier. Great price, quick delivery the rug looked just like the picture. Looks great in my room! I love it! Looks great in my living room and I bought another one for an air b n b I own. Love it it is soooo beautiful. Nice quality! "The chair in the pic what is the name. Oh please!! Love the whole set"
"How big is this rug?" I have the 5 X 8 and it fits in front of a 3 cushion couch and takes up 8' to the TV unit. Hope that helps. "I'm searching for this rug in a runner size, like 2 ft. x 6-7 ft. Has anyone seen or ordered this size?" This rug is not currently available in a runner size. "Also, is that a tad of Grey in the center? Thanks." There is a little grey in the rugs but the picture is pretty right on. 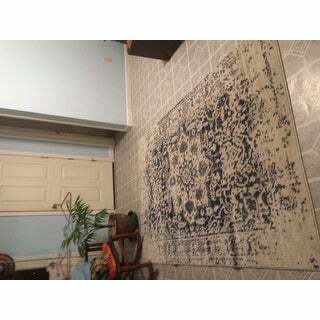 "For those who bought this rug, or Overstock staff, would you say this is more blue & white or blue & beige? Thanks!" More navy and cream, not beige and not white. For my foyer to match the 2 runners purchased. "Is the Navy a bright navy or a dark navy?" In my opinion this rug features a dark navy.